The White Park Cattle Society spring pedigree sale was held at Worcester Livestock Market on Saturday 23 April. There was an excellent attendance at the sale from members and several lots were purchased by prospective new members. At the Show which took place before the sale, judged by John Barker, the Champion White Park was a 23-month-old bull Pantgwyn Victor, bred by Jessica Byrne Daniel and owned by David Graveston. Victor achieved the top price at the sale of 2.200 gns. He had an impressive daily live weight gain of 1.27 kg to weigh 930 kg at the Sale. Pantgwyn Victor is a son of Dynevor Calibre, which has sired a number of high quality sons, out of a daughter of Smoile Rufus 2, whose progeny are noted for size. Pantgwyn Victor was purchased by member James Woodward. “David nearly bought Longhorns! However he remembered, in time, the striking RASE herd of White Park Cattle which chastened him and the family during their visits to Stoneleigh on business regarding their Bees. In 1990 David bought his first White Park cows, Toddington Alexia and Nina and later heifers Nadia and Drusilla, the latter a daughter of the famous Dyevor Tawe 9. Drusilla gave him his first heifer calf, (all other calves till then had been bull calves) he named her Whitebeam after the profusion of whitebeams in our village of Strelley. I knew very little about cattle, being a horse person; but learned so much from David who had grown up with cattle. As the Strelley herd increased David was able to help new members to start their herds and felt that he was doing his “bit” to promote the breed. This he also did by showing at Stoneleigh, Moorgreen, Ashbourne, Stafford, Newark and Derby with great success and collected many rosettes which completely fill our cabinet in the sitting room. David and I had many happy and fulfilling years with his White Parks and the friends he made within the Society. The family and his beloved White Parks were his life. I was asked to write these few words for the Society News Letter, I hope they wouldn’t have embarrassed him. The White Park Cattle Society was sad to hear that Michael Rosenberg recently passed away. Michael was a founder member of the Rare Breeds Survival Trust and was a valued friend of the President of the White Park Cattle Society, Lawrence Alderson. Lawrence has written the following tribute to Michael. Michael Rosenberg was a larger than life personality. He first settled in England in the early 1970s but spent much of his later life in the Isle of Man. His influence touched many areas of life but he had a particular interest in farm livestock. He became involved with the embryonic Rare Breeds Survival Trust (RBST) and his energy, enthusiasm and financial support saw it become the most important rare breed’s organisation in the world. He was the most powerful driving force in RBST for many years, serving as both its Chairman and President, and was responsible for developing some of its most important projects and programmes. I have been involved with RBST from the beginning and can say without qualification that without his involvement many native breeds might have become extinct, and the significance of his work was recognised when he received a CBE in the 1980s. He was a modest unassuming man, but his gentle courtesy hid a keen mind and amazingly retentive memory which underlay his organisational ability and attention to detail. His influence spread beyond RBST. His support for the Royal Agricultural Society of England was recognised by his appointment as Vice-President, and many breeds and agricultural organisations benefitted from his support. When I first met him in 1973 he was exploring the options open to him for his farm in Devon, but his interest soon was fixed on rare breeds. He established herds/flocks of cattle, sheep and goats which his meticulous recording and judicious breeding raised to a level where they exerted positive influence on other herds and flocks. He and I created both the Ark and Combined Flock Book which eventually were passed to RBST. He donated his herds of White Park and Longhorn cattle to the National Trust at Wimpole, and some of the sheep to RBST. 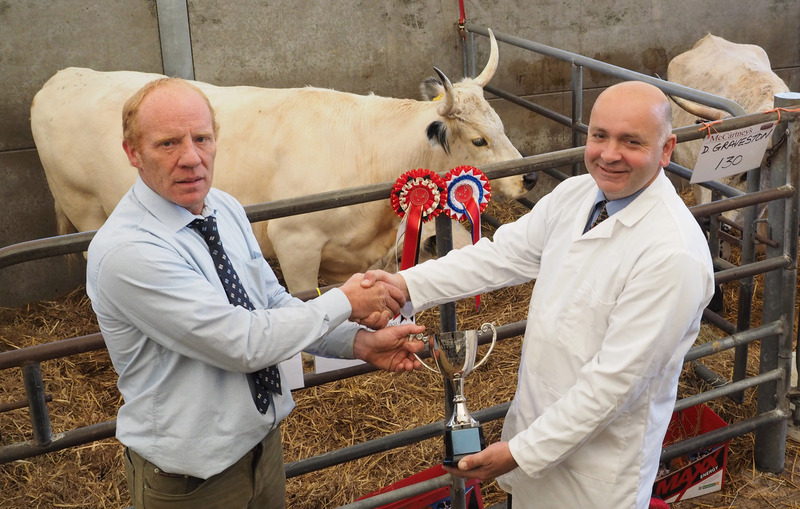 He achieved an ambition that meant a great deal to him when one of the Murray Grey cattle won the Interbreed Championship at the Royal Bath and West Show in 2015. He was a familiar figure at Shows and RBST events in the 1970s and 1980s, rarely seen without his Camels, and developed a particularly effective style of membership recruitment based primarily on his irresistible charm and courtesy but helped inevitably by champagne and strawberries. He was equally effective in the Council chamber where his quiet, but incisive, interventions led to many positive and valuable decisions. For me, he was not only an astute business associate, but also a true and valued friend. He also possessed a deliciously wicked sense of humour. We planned to celebrate the 80th birthday of his father, Murray, in unforgettable style. However, when the Intercontinental Hotel declined to allow us to parade a gift of two Murray Grey heifers in the hotel, Michael simply presented him instead with a package of their droppings. Despite all the fascinating aspects of his personality, Michael was essentially a private man. His influence was widespread but he would not have approved of a catalogue of his achievements and this brief commentary on his life does not do him justice. He died suddenly on November 3 at home, and we extend our condolences to his wife Jocelyn and his family. The White Park Cattle Society autumn newsletter is now available. Visit our Home Page to download a copy. Inside you can hear all about how White Park beef was shortlisted in the Best Producer Category of the Observer Monthly Food Awards and read reports from our AGM and Autumn Breed Sale. The White Park Cattle Society is very sad to hear that Joe Henson passed away peacefully on 5 October, surrounded by his family. Joe founded the Rare Breeds Survival Trust and the Cotswold Farm Park. 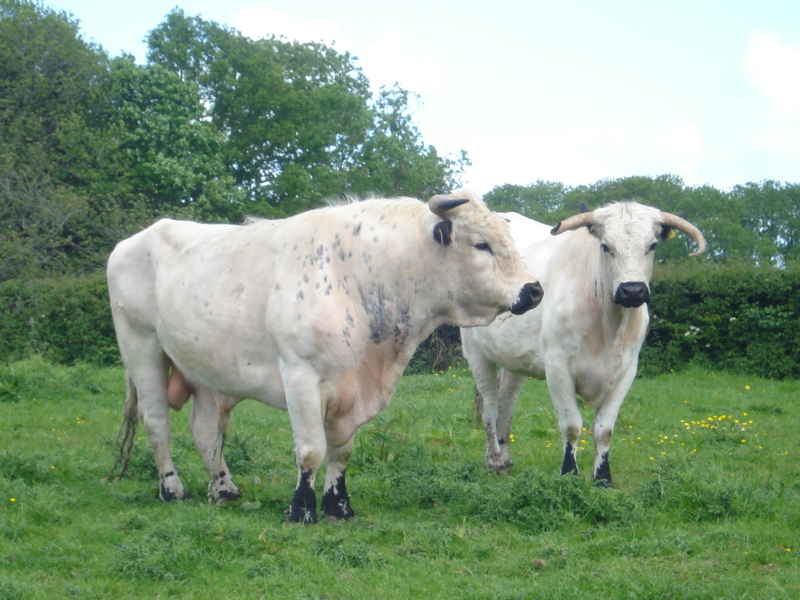 White Park cattle are one of the rare breeds that reside on the farm. We would like to pass on our condolences to the Henson family. The annual White Park Cattle Society Show and Sale took place at Worcester Livestock market on 25/26 September. Following the Show on Friday evening when Pennyspot Pheobe owned by David Graveston was awarded the Champion rosette and Heathylee cup for best overall female, six females were sold through the ring on the Saturday. All lots exceeded their reserve prices and attracted keen bidding. Potential new members were able to visit our stand at the market and pick up a free car sticker and information leaflets. At our annual show on Friday 25 September at Worcester Livestock market White Park cow Pennyspot Pheobe was awarded the Champion rosette and Heathylee Cup for best overall female. Pennyspot Pheobe was bred by John Carrick and is owned by David Graveston. She was born in 2009 by Smoile Napoleon out of Pennyspot Ivory and has just given birth to her fourth calf. The following day Pennyspot Pheobe and her calf were sold during the WPCS Annual Sale. If you are passionate about food, farming and rural life then you may well already be a reader of “Countryside”, a monthly magazine published by the NFU. The magazine runs a regular feature highlighting a rare breed found in our countryside and in September’s edition our beautiful White Park cattle took the starring role. If you do not receive the magazine as a member of NFU Countryside or have not come across it in a farm shop etc, then you can read the magazine online. The White Park Cattle Society is committed to encouraging young people to enter the agricultural profession. In June we were delighted to welcome Elliot to his first AGM and Open Day – at the grand age of 6 months. 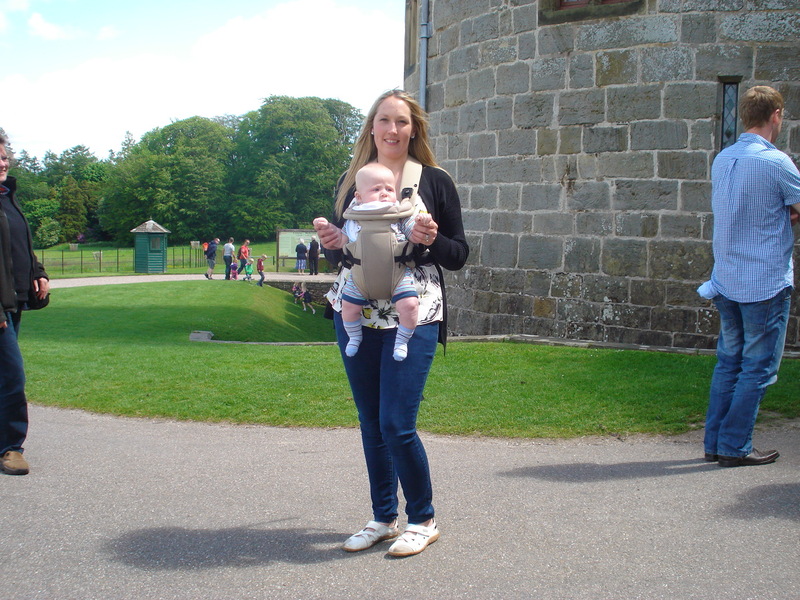 But this was not Elliot’s first White Park Cattle Society meeting – he attended his first meeting at the tender age of 3 weeks! 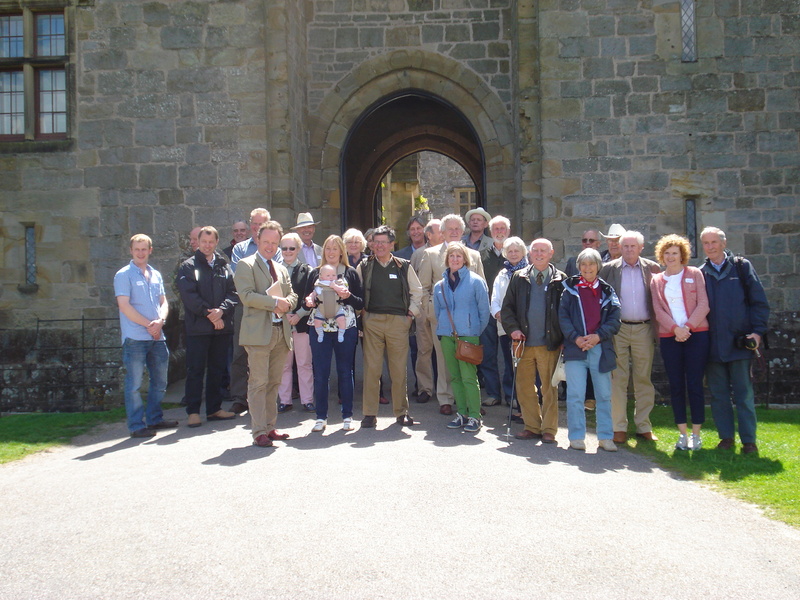 Chirk Castle near Wrexham proved to be a fantastic location for the White Park Cattle Society AGM and Open Day for 2015. We would like to thank member Guy Myddelton for making all of the arrangements with the National Trust. The day started with our formal meeting in the Castle function room. After lunch the members were then treated to a private tour of the Castle led by Guy Myddelton, who grew up in the stunning building and played with his train set in the historic rooms. After the tour of the building we viewed the beautiful gardens and went to see the White Park cattle that reside in the parkland beyond the ha-ha. The afternoon session concluded with a visit to Guy’s family farm in deepest Cheshire countryside where 2014 and 2015 calves and heifers are living. Guy’s wife Emma provided a fantastic afternoon tea. During the evening the members returned to the Castle for a delicious evening meal of White Park beef. The occasion was rounded off by an auction of paintings and prints donated by President Lawrence Alderson and a John Deere mower donated by Council Member Frank Sutton. Interest in the items was fierce and as well as bids in the room we also had bids placed by telephone. 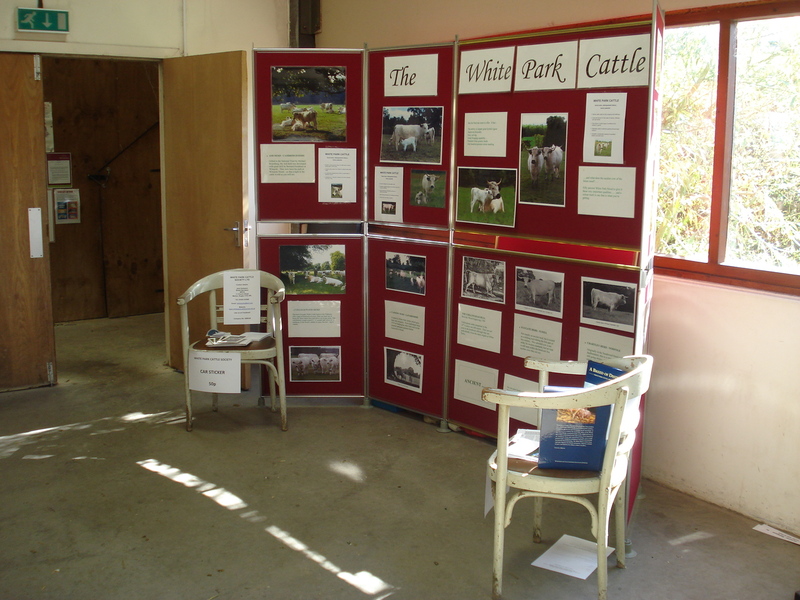 All money raised by the auction will go towards helping to preserve our historic White Park cattle breed.